Streetsblog Denver is back after a vacation hiatus. While away, motorists killed people, the mayor made bike lane promises (so did his streets department), and the RTD election slate crystallized. Motorists killed two people walking between July 10 and July 25, according to the Denver Police Department. Last Friday a driver killed a person walking near the 4600 block of N. Elm Ct. Last Saturday, a motorist struck and killed someone walking on I-25 near Park Avenue before driving away. Streetsblog will have more information on the identities of the victims and motorists next week. Drivers seriously injured three people walking and one person biking on city streets between July 10 and July 25. One person in a car was killed over that stretch. 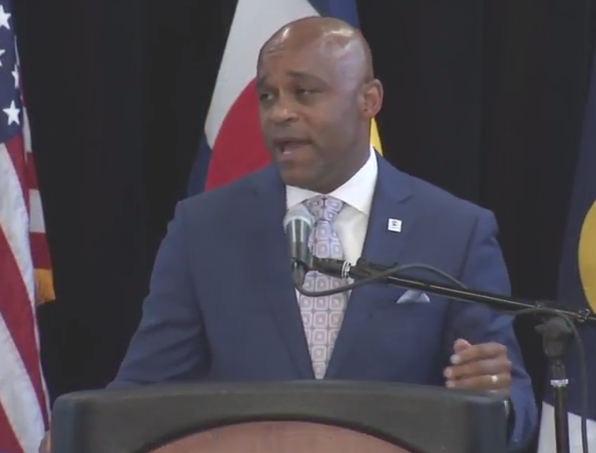 On July 16, Mayor Michael Hancock spent four minutes of his 42-minute State of the City speech talking about transportation. The mayor endorsed free-roaming bike-share and scooter-share as “the next phase of shared mobility,” talked up the city’s nascent neighborhood sidewalk maintenance program, and urged the Regional Transportation District Board of Directors to adopt a new price structure that would give low-income residents a 40 percent discount and provide free transit for kids 12 and younger. None of those things constitute news. But Hancock made a promise that does: Building 125 miles of bike lanes over the next five years. If the mayor’s streets department actually delivers, that would mean an increase of 11 miles per year over the city’s current pace, according to DPW statistics [PDF]. 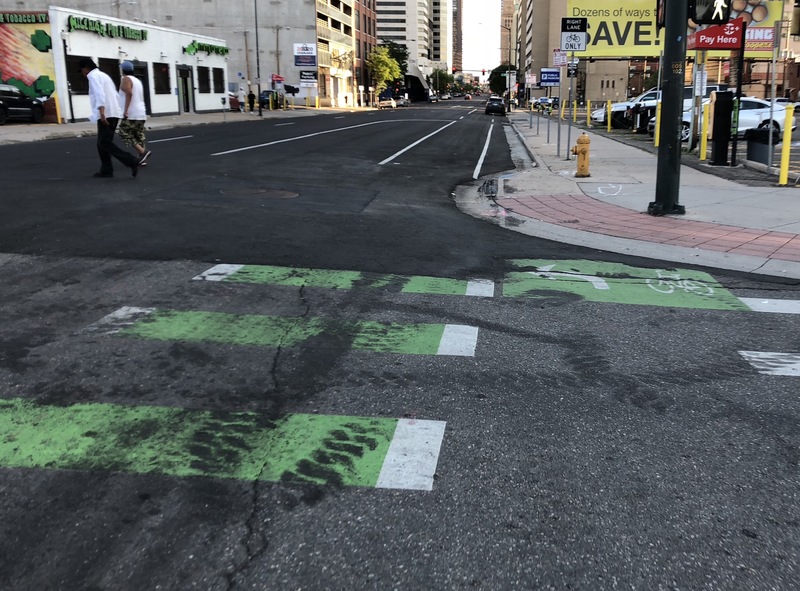 Denverites have reason to be skeptical given the lackluster pace of new bikeways combined with the sorry state of maintenance on existing ones (see below). In his speech, Hancock reiterated support for safety fixes to Federal Boulevard and Colfax Avenue, but rested those hopes partly on the shoulders of voters. The mayor also announced a hyper-local initiative to calm traffic via the Neighborhood Transportation Management Program. “City crews will be walking neighborhoods with residents and working together to immediately fix what needs fixing,” Hancock said. “It could be replacing a stop sign at an intersection, improving a neighborhood bikeway, or addressing potholes and curbs.” DPW will start with Sun Valley and West Colfax, according to the mayor. After some public shaming that revealed Denver Public Works’ incompetence when it comes to maintaining bike lanes, the streets department responded with a more concrete timetable for fixing and replacing the missing infrastructure. The deadline to register as a candidate for the RTD Board of Directors has passed, and 18 candidates will try to fill seven open seats this November, reports Colorado Politics. Five of those seats — districts B, C, K, L, and N — are competitive. Districts J and O each have just one candidate running. Check which district you live in on this map. I wondered how much of that 125 miles was already baked in? So you’re saying it’s an increase of 11 miles per year over the current pace and Hancock made it a five-year commitment. If most of those lane miles are simply painting lines on arterial and collector streets it should be easy peasy. Currently Denver has 130 lane miles so it would almost double that; not bad (but Phoenix currently has 596 miles with plans to add 200 more miles) but at least Denver is headed in the right direction.